Brother Jesse Blog: The Networking Platinum Rule: Follow Up, Follow Up and then Follow Up! The Networking Platinum Rule: Follow Up, Follow Up and then Follow Up! If you have been following my blog over the last several years, you know I am always among the many thousands in attendance at the Annual Nation of Islam Saviours' Day Convention. Not only do I enjoy all of the events but I also see it as a great opportunity to network! That word networking is sometimes overly used by people who are really not doing it. Don't get me wrong, when you're at a conference such as this one, with people everywhere, it can get tiresome but that's only if you see it as a task versus a joy. In the midst of me covering 4-6 workshops at a time each day for The Final Call newspaper, taking hundreds of photos, doing video interviews, updating my social networking sites and conducting live blogging, I am able to make connections with a lot of people. Notice I said connections, not contacts. There is a difference. However, it all goes for naught if we don't follow up! 1. Put in work BEFORE the conference: Over the months prior to the conference I worked hard to increase the traffic and readership for my blog by providing helpful content. Hence, when I got to Saviours' Day,p many attendees already knew my face from reading it and they knew my name from my articles in The Final Call Newspaper as well. What have you done before the conference to position yourself? 2. Came prepared to market: I brought a few thousand two-sided business cards for distribution. One side was my blog information and the other side was my Final Call info. Plus dressing the part helped too! 3. Engaged People: Although I was writing, shooting and videoing I was not being stand-offish when it came to greeting people, sharing brief information about myself, learning about others and exchanging information for future connections. This included in between workshops, during them, at the vending area, at the airport and even on the hotel shuttle rides. Note! I'm not a big advocate of just handing out cards just for the sake of doing it but this tactic helped because before I could say to a person "My name is Jesse..." they would cut me off and say "Hey, I just picked up your card when I got some water!” That sparked conversation. 5. Interviewed panelists and attendees: There is nothing like making a friend by asking them for a quote. I get so much video footage that it takes weeks to edit and upload it! 6. Followed up during conference: Since I had my cell phone with me all the time I would sit and send follow up emails to people I had just met to thank them for the brief talk and mentioned in the email some of the things we discussed. I also sent emails when I went to my laptop in the press room. They would be shocked that I would follow up so quickly. 7. Followed up in the Hotel Room: I was sending more follow up emails, connecting with people on Facebook, Myspace, Twitter, etc in the evening and driving traffic to my blog. I was updating my blog every night with new photos and content. 8. Followed up some more when I got home: More emails were sent, wrote messages on Facebook walls, sent Twitter messages and emailed out blog posts that featured certain people I met. My number of blog subscribers increased too. So the next time you go to a conference, don't just blend with the crowd....engage them! 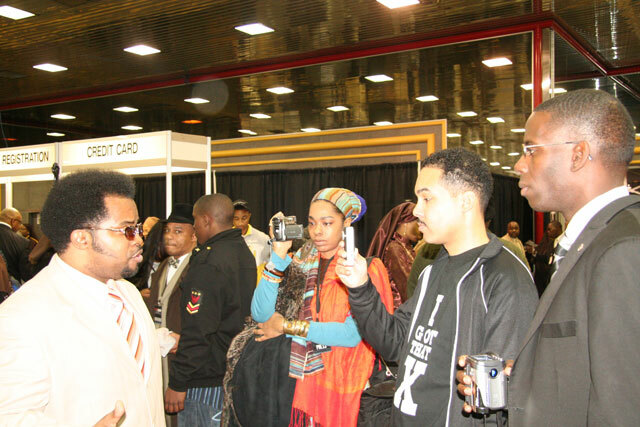 See you all at Saviours’ Day 2011!